AN ADORABLE & SWEET FELLOW: 11 years old / 60 lbs. Mostly Mutts adoption center is open Mon-Sat. 11-4pm. Some of us are in foster homes so please call 770-272-6888 1st to find out if I’m available to meet during the week. I’m a sweet boy who loves chin scratches & enjoys being petted for as long as you like, & just hanging out near you. I liked the other two dogs in my former foster home that were about my size, & I’ve also liked the smaller dogs I’ve met too, so if you have a nice dog at home, let’s meet & see if we can be friends. I also met a kitty at the MM facility & did very well with her. 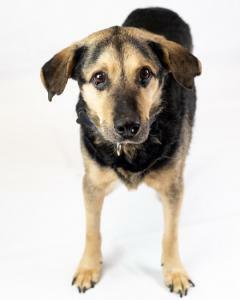 I’m an older guy, so I have some hind leg weakness & shouldn’t live in a home with too many stairs, & I do best on carpeted areas or hard floors that have rugs. I have a little mischievous side which is kind of cute given my age. I once took a fork from the dishwasher & I sometimes like socks that may be laying around. LOL Please keep a close eye on me if I do get a hold of a sock or around any plush/stuffed dog toys as I tend to confuse them for snacks & may eat them, which will make me very sick. I haven’t gotten on the furniture, due to my leg weakness, but I’m perfectly happy in a nice comfy dog bed near you. I crated well in my former foster home, but after a while I no longer needed it. I have done well with my potty manners on a good schedule, but I’m not sure I could hold it all day. Sometimes I have #2 accidents in my sleep because I think I have lost a little feeling back there, but they are easy to pick up. I also had some #2 accidents during the day in my former foster home, sometimes I don’t realize I have to go until it’s too late. It’s best I’m let out frequently, & a doggie door may be a good option for me (though it’s not required). Since I’m an older fellow, I have some diminished eye sight, but it’s not too bad, just be careful when giving me treats from your hand as I LOVE treats and have accidentally gobbled at hands holding treats. Oops, I didn’t mean to! I seem to have some seasonal allergies that cause my eyes to get a little goopy, so I use eye drops as needed. I take a Glucosamine supplement for joint health & fish oil to keep my coat looking nice as I tend to have dry skin & sometimes a little dandruff. I also take a medication called Rimadyl as needed to help with pain & inflammation in my hips & back legs. You can throw the pills right in my bowl & I’ll chomp them down with my dog food, yum! I get anxious during thunderstorms sometimes, but I wore a Thunder shirt in my former foster home & that seemed to comfort me a little. I love being outside in my yard with my people or another nice dog for a little while, sniffing around & enjoying the sun & a gentle breeze on warmer days. I get little burst of energy when I’m outside too, & I enjoy short walks. I’m very good on the leash, I don’t pull at all & I love a nice, slow pace. I ride well in the car once I’m situated, & I use a ramp to get in & out. I also use a sling as needed to support my back end when I need a little help standing up or on slippery surfaces, so just ask about that. Older kids would be best for me due to my size & that I take treats a bit roughly. Check out my Instagram page (Granger @mostly_granger) for more pictures of this GrAngelic face! Energy level: 2-4. Sadly, I wasn't kept on Heart Worm prevention in my previous home, but I’ll easily be treated for that at home with a specific heart worm monthly treat. I'm current on vaccinations, micro-chipped, neutered, and my adoption fee is $100.00 which also includes an engraved name tag, Martingale collar and leash.